They say there ain't no cure for the Summertime blues. And that goes for pageviews too! 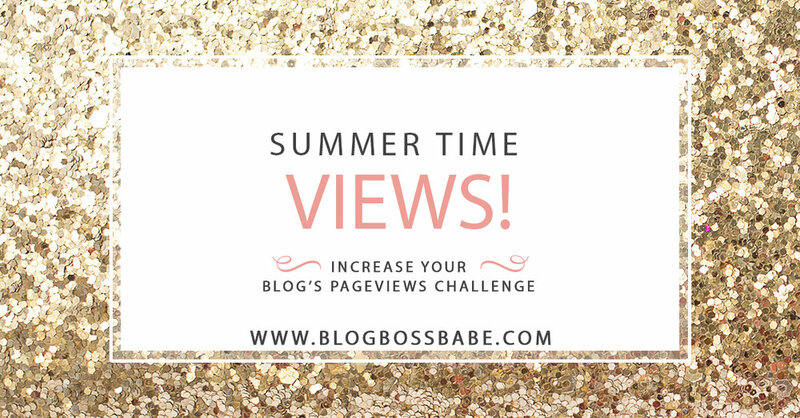 Summer is a particularly hard month for bloggers, so let's change that! This challenge is all about getting more views on your blog. Of course, one of the most important parts of your blog is laying a good foundation. That means having winning content and writing that keeps people coming back for more. My suggestion is to find your WHY. Why should people to read your blog. Here's a workbook to help you succeed (scroll to bottom of the page). Now that you have the right foundation, let's take it a step further and map out the essentials for your blog. Find a video and workbook here that will help you plan out your blog and help you find areas of strength to focus on! One of the best (and easiest) ways to immediately increase your online prowess and pageviews is by repurposing and optimizing existing content on your blog. Take an old post that you know is good, make it better, RESHARE! 1. Add a pinnable image. You know that grainy selfie you have there as the main image? Leave it. I like seeing my blog progress. But now, I add an image to the post that goes with the post. I typically an image with text that goes along with the post. I did this recently with my post on Dinosaur Poop Cookies. As soon as I pinned it, I received repins and hits! Read through your old blog post and see if it could use a refresh. Make sure it makes sense in today’s terms. I edit my posts and rework the content with fresh eyes to make sure it logically makes sense. A lot of my first posts are a little wonky. My writing is centered and it doesn’t read as well. I reformat the post to ensure it has a nice flow and it easier to read. This is a great way to bring hits to your current blog posts, but you can still do the same with older posts. Check out my SEO guide for bloggers and use this on your old blog posts as well as new ones. Make your content more relevant by linking it to your previous posts or online articles that relate to your topic. I updated my post “How To Start a Blog” that regularly gets hits, but could use some links to more recent posts that cover some of the topics explained. Share your “new” revamped, old posts on social media. Pin them, tweet them, Facebook them, etc. Your blog audience has grown and your content has been refreshed, your followers might find your old content interesting. I have a confession. I let my blog's Facebook page go down the toilet the last few years. But this year I decided to treat it like I did other social media channels and actually put in some effort. I scheduled blog posts and content from others and saw a massive spike in engagement and even followers. What I mean here is share 80% interesting and purposeful content. 10% share your personal stuff and 10% promotion or blog related. WATCH how much you grow. Don't forget to check out the Blog Boss Babe section all about Social Media!